The “crazy gene” is linked to the feeling of intense satisfaction that comes from throwing yourself into an insanely hard, sometimes senseless physical and mental challenge. On July 1, an affiliate posted a video of some dude doing 1,000 muscle-ups for time. Challenging? Sure. Great programming for the average athlete? Perhaps not. But every sport, from gymnastics to marathon running to mountain climbing to skiing, has devout members who want to take things to the extreme. So the 1,000-muscle-up dude was probably just having one of those days where he submitted to the crazy gene, just like when a mountaineer decides to climb Everest. The point is 1,000 muscle-ups for time isn’t your average CrossFit workout. A workout like that is not recommended for most of the population, but it does show us what the human body is actually capable of. On the flip side, what’s becoming more typical in CrossFit is a movement away from the crazy gene. Instead, a growing number of CrossFit boxes are trying to help members understand that high performance isn’t just about endless volume and ceaseless intensity. Performance is related to a host of factors including mobility, recovery, rest, nutrition, technique and more. This should be mandatory reading for Crossfit coaches. I recently had a discussion with a coach whose attitude was "no matter what, you're gonna get injured at some point". Isn't that the antithesis of Crossfit? 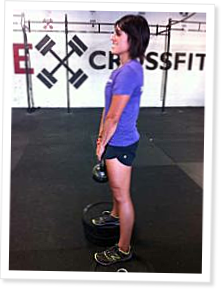 Aren't we Crossfitting because we're interested in living healthier lives? It seems like periodizing this type of training helps accomplish the goal. So, is the program a secret? Is there a training course to take? Are we supposed to guess what it is? Nice build up of something that other boxes could use with no real substance in the article. Poor journalism in my opinion. From the article: “When you start, you’re so excited. You see tons of results. You get stronger and leaner. It’s amazing,” she said. “But then you get a nagging injury that sets you back, and that nagging injury doesn’t go away,” she continued." At my level one we were taught "mechanics and consistency before intensity" Class structure was taught as a group warm-up that thoroughly prepares participants for the movements that are in that days WOD (not 2 or 3 random things thrown up), scaling is taught and done consistently (based on % of 1 RM as well as BW rep maxes) for each WOD, and there is a group MOBILITY and RECOVERY period at the end of each class. CrossFit as taught is already a form of rehabilitation and movement correction - at least when its practiced the way it is taught. I think this article is an excellent example of a lamentable trend with the Journal, which seems to have begun about two years ago or so. It is certainly well crafted- indeed it has been crafted by a professional journalist, but seems more of a embedded marketing/communications piece rather than an article of actual substance. If you review earlier Journal articles, especially up to say 2008, there is substantially more "meat". This is not to say that there no place for these kind of pieces, but, rather they might best be presented to a different audience as Journal readers have paid their subscription and thus demonstrated strong interest in Crossfit and fitness theory in general. In short, they are not an audience that needs to convinced of Crossfit's merits but may be an audience looking looking for a level of depth that has been lacking of late. I like this article and idea - can we have some detail of the Back 2 the Basics program, please? It looks helpful ... Open source? I'm happy this article was written but I think its long overdue. I don't expect Ute CrossFit to just give away their programming, but perhaps some of it could have been included in this article or HQ could have written their own program. I feel like this article could have been one sentence "CrossFit sometimes causes injuries and you should take the time to rehab them." Nonetheless, I appreciate HQ starting to address this issue, I hope that they put out more. I agree, is this program a secret? I thought we were a community. Why tease us about how great it has worked out but not provide us with the program? I certainly can not afford to fly the programmer here to Germany to show me the routine, I pay enough for Crossfit certifications and Crossfit products.